At Corona Contracts we have over 20 years of experience contracting for schools and education businesses. Amongst our specialities are stage curtains for schools, commercial blinds, curtain track systems, window films and customised manifestations, which we design, manufacture and install for institutions across the country. 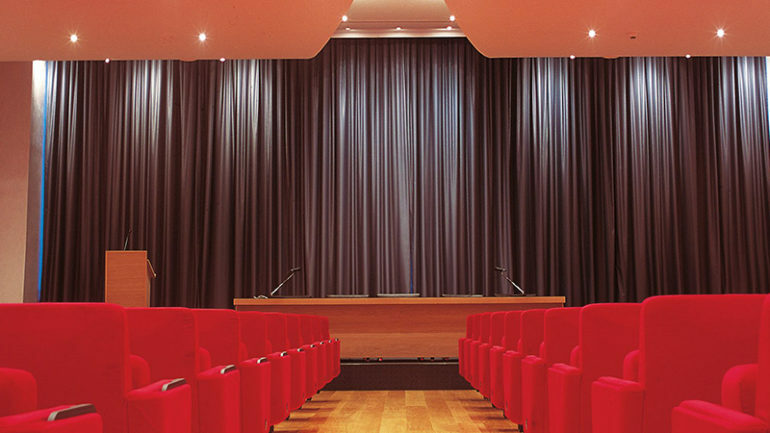 We are trusted contractors, having carried out successful projects in various parts of the UK including Lancashire, Cumbria, Cheshire, Merseyside, Greater Manchester, Preston and Liverpool, where we have supplied stage curtains for schools and halls, as well as other bespoke curtain and blind installations. We have lots of experience when it comes to fitting curtains and blinds in schools, and if you require stage curtains for a hall or assembly room we can design something to your exact specifications. If you run a school you know how important it is to find responsible contractors who will stick to a strict schedule. We always work closely with our clients to make sure they are well informed at each stage of the job, whether the project is small or large. All our staff are trained to the latest health and safety site regulations, and will attend an individual site risk assessment if required. Corona Contracts are used to installing in many different environments so are very sensitive to the fact that different clients have different needs. In the past we have worked with open private and public health service wards- where the privacy of patients is very important- as well as children’s nurseries, school buildings and classrooms. Our ability to create bespoke products as per our clients’ specifications allows us to deliver exactly what is needed in any given situation. We manufacture many of these systems ourselves with our commercial blinds division, giving us complete control over delivery times and costs. We pride ourselves on great customers service and our valued clients always benefit from complete attention from the beginning of the project to the end. If you have any questions or you want to learn more about our services, please don’t hesitate to contact our friendly service team on 01772 616426.